There is nothing more emblematic of summer than fresh, juicy strawberries. It is easy enough to enjoy them right out of the carton on the way home from the farmer's market, but sometimes putting in the tiniest bit of effort makes those lovely jewel-like berries shine even more than they would have on their own. 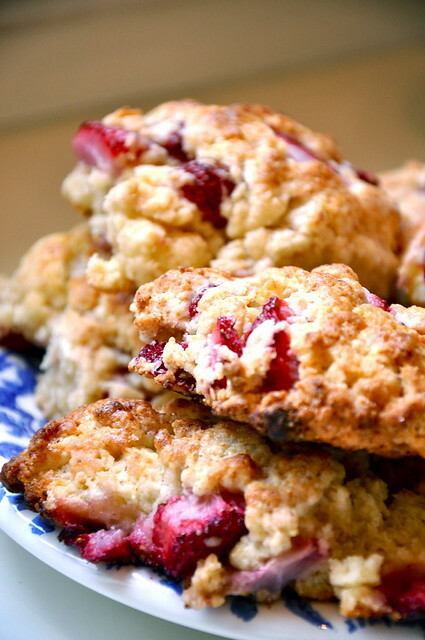 Strawberry shortcake has been my go-to summer dessert for as long as I can remember. After drooling with envy over my little brother's asian-inspired strawberry shortcake a few nights ago, the switch was flipped. It hit me that it was strawberry shortcake season. Rather than going the more traditional route, I decided to try for something a little different. Lucky for me, there was a post on Smitten Kitchen not too long ago that I had filed away in my brain as a must-make for summer. Having spent three months with Nathalie Dupree making biscuits five days a week, I'm always intrigued by biscuit recipes. As I've said before, I was never really into biscuits. I guess that's the non-Southerner in me talking. But after that fateful summer of biscuit, a good biscuit can really turn my head. And these? Well, these are good biscuits. 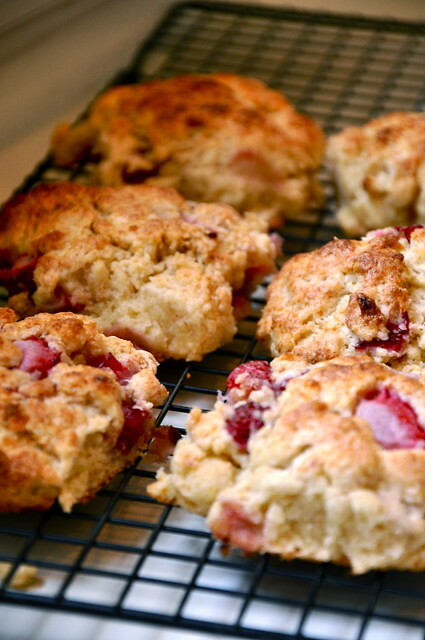 They're probably more akin to a scone than a biscuit, but let's not split hairs here. 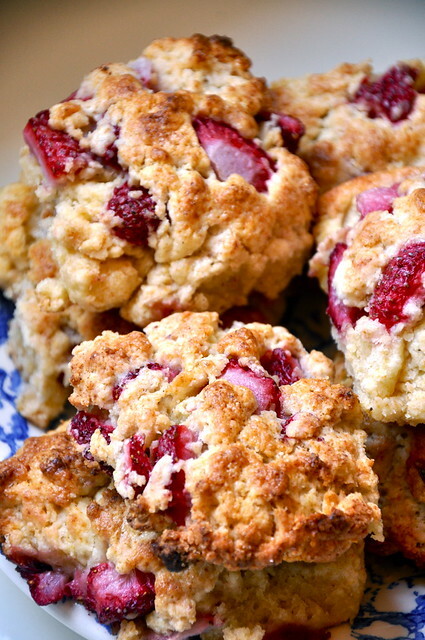 Think of them as a portable strawberry shortcake- the perfect accessory to a summer brunch or breezy picnic. Preheat the oven to 425. In a large bowl, whisk together 2 cups flour flour, sugar, baking powder, and salt. Add butter to dry ingredients, and, using a snapping motion, work butter into dry ingredients until butter is in pea-sized lumps. 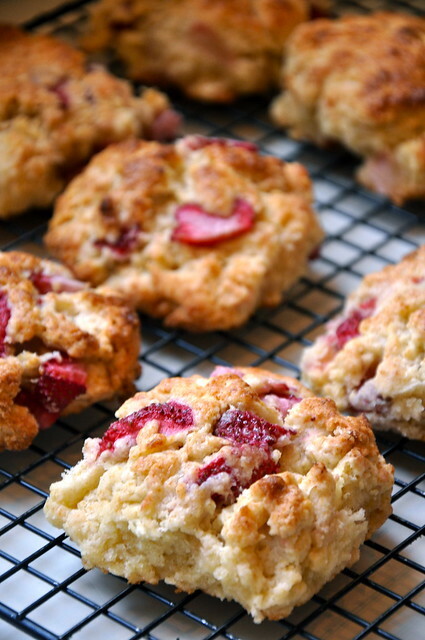 Toss strawberries in dry ingredients, coating. Make a well in center of dry ingredients and pour in heavy cream. Stir in heavy cream using a figure-eight motion, careful not to over-mix, until dough is shaggy but cohesive. Dust your work surface with all-purpose flour and coat your hands. Fold the dough in half; pat it out into a 1/3- to 1/2-inch-thick round, using a little additional flour only if needed. Fold the dough in half a second time. If the dough is still clumpy, pat and fold a third time. Pat the dough out into a round 1/2-inch thick. Brush off any visible flour from the top. For each biscuit, dip a 2 1/2-inch biscuit cutter into the reserved 1/4 cup of flour; cut out the biscuits, pressing firmly, starting at the outside edge and cutting very close together, being careful not to twist the cutter. Transfer the biscuits to a baking sheet, each butting up against another. Brush with heavy cream. Bake for 12-15 minutes, until the biscuits are a light, honey color. Turn the biscuits out upside-down onto a plate.